about the importance of growing entrepreneurs in the South African economy. First off, why is there a current focus on entrepreneurs? Government and big business can no longer absorb the masses of school leavers and graduates coming into the market each year. As such entrepreneurs are regarded as the single greatest hope in creating employment. Innovative thinking will lead to better efficiencies, improved effectiveness and upgraded processes in the business market. These outcomes can yield greater economic and financial growth in the country and a better life for new entrants into the economy. We know that worldwide statistics for successful entrepreneurs are low, showing as much as eight out of ten companies failing in their first two years. Would you say that we are in a better or worse situation with regard to entrepreneurs being successful? Better! We believe in South Africans and we believe that we are in a better position. Setting up and managing a business in SA is perhaps as complex as any other business environment in the world with regard to being compliant, meeting operating standards, customers' demands, along with shareholders expectations. But South Africans have an underlying culture of ubuntu along with good people who are extremely tenacious during difficult periods. Do you think that there is a formula for understanding the probability of a new business venture being successful? Perhaps not a formula. We think that we can follow a methodology to help identify strengths and weaknesses in the entrepreneur's idea, leadership attributes, and the business structure and environment. Too often people tend to think that the entrepreneur's vision or idea is the business. It's really not. The vision or idea helps to direct action and passion, but the business is the system that integrates operational activities within the company. We rate entrepreneurs on the attributes needed to help ensure their company's success and support a more productive functioning model. Except there will always be that X-Factor with entrepreneurs, where they are successful in creating a popular commodity, and providing advantageous returns to investors and staff − without needing a defined methodology. What would you say makes up an entrepreneur's X-Factor? 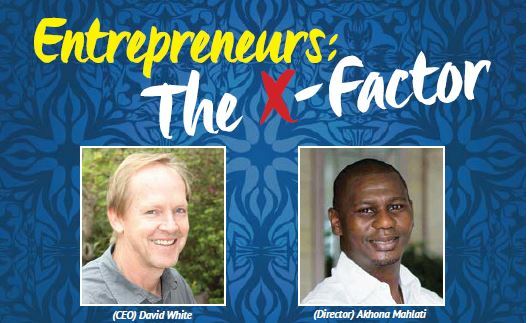 An entrepreneur's ability to adapt to the uniqueness of his or her business environment is the greatest example of what characterises the X-Factor. are the benefit and attraction the product will have in the market as well as the entrepreneur's ability to reason wisely and to guide the business along its path of progress. Lastly, we cannot discard the entrepreneur's ability to lead people and to create an engaging staff culture. Please talk more about the business environment. activities, exchange rates, legislation and of course a strategy to steer the business idea into a valued commodity. Of great importance in the South African context is Broad- Based Black Economic Empowerment (B-BBEE), which is a legislative framework that has been put in place to even out the historically unequal economic playing fields. It indirectly alleviates larger corporate companies from dominating markets at the expense of the smaller up and coming enterprises. This is certainly an important consideration in the optimal functioning of our society and the business sector. Last question. You guys are part of a team that have created a business mentoring service for entrepreneurs. Can you tell us a bit about this company? BusinessFit was developed by 12 KwaZulu-Natal based business leaders. Each person is a specialist and a seasoned business head of their own company. Entrepreneurs engage BusinessFit to draw in professional support partners to help them create the foundation they need to build their business idea upon. Our aim is to help make more businesses more successful more often. We achieve this aim by supporting the entrepreneur's vision and idea with structured support. BusinessFit has specialist mentors in each business activity, including strategy, marketing, financial management, cash flow management, human resources, systems, website design, B-BBEE, etc. and help them to improve their suppliers' service quality and business longevity. Thank you David and Akhona for your time and comments!